The study of the ancient astronomical knowlege of tribal, aboriginal, or extinct cultures. Native American Moons Names in the lunar calendar. Native American Starlore Legends from the Americas. Native American Sky Names for things in the sky. Medicine Wheels Ancient artifacts on the Great Plains. Neakita An American story by Brad Snowder. Greek Mythology Western culture and tales of the sky. Stonehenge The quintessential stone monument. Cosmic Quotations A multi-cultural collection. Allen, A. 1963. Star Names - Their Lore and Meaning. Dover Publications. Aveni, A. 1992. Conversing With the Planets. Times Books. Aveni, A. 1990. The Lines of Nazca. American Philosophical Society, Philadelphia, PA.
Aveni, A. 1992. The Sky in Mayan Literature. Oxford Press. Aveni, A. 1980. Skywatchers of Ancient America. University of Texas Press. Aveni, A. 1993. Ancient Astronomers. St. Remy Press and Smithsonian Institution. Beyer, S. 1986. The Star Guide. Brown & Co.
Bierhorst, J. 1988. The Mythology of South America. Wm. Morrow. Bierhorst, J. 1990. The Mythology of Mexico and Central America. Wm. Morrow. Bierhorst, J. 1985. The Mythology of North America. Wm. Morrow. Erdoes R. 1997. American Indian Myths and Legends. Peter Smith Publisher Inc.
Krupp, E. C. 1978. In Search of Ancient Astronomies. Doubleday and Company, Inc.
Krupp, E. C. 1991. Beyond the Blue Horizon. Harper Collins. Litman, M. 1982. Skywatchers of Ancient Mexico. Hansen Planetarium. Malville, J. M. and Putnam, C. 1989. Prehistoric Astronomy in the Southwest. Johnson Publishing. Ridpath, I. 1988, Star Tales. Universe Books. Staal, J. 1988 New Patterns in the Sky. McDonald and Woodward Publishing Co.
Swarup, G., Bag, A. K., and Shukla, K. S. History of Oriental Astronomy. IAU Coll. 91, New Delhi, India, 1985; Cambridge Univ. Press. Weiss, M. 1982. Sky Watchers of Ages Past. Houghton Mifflin Co.
Williamson, R. A. 1987. 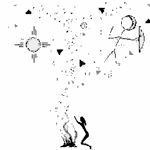 They Dance in the Sky : Native American Star Myths. Houghton Mifflin.